USES: Cyanocobalamin is a man-made form of vitamin B-12 used to treat low levels (deficiency) of this vitamin. Vitamin B-12 helps your body use fat and carbohydrates for energy and make new protein. It is also important for normal blood, cells, and nerves. Most people get enough vitamin B-12 in their diet, but a deficiency may occur in certain health conditions (e.g., poor nutrition, stomach/intestinal problems, infection, cancer). Serious vitamin B-12 deficiency may result in anemia, stomach problems, and nerve damage. HOW TO USE: Before using, check this product visually for particles or discoloration. If either is present, do not use the liquid. This medication is given by injection into a muscle or under the skin as directed by your doctor. Dosage is based on your medical condition and response to treatment. Injections may be given daily when you first start treatment. Certain medical conditions (e.g., pernicious anemia) may require you to continue receiving injections every month. Learn how to store and discard needles and medical supplies safely. Consult your pharmacist. SIDE EFFECTS: Pain/redness at the injection site, mild diarrhea, itching, or a feeling of swelling all over the body may occur. If any of these effects persist or worsen, tell your doctor or pharmacist promptly. Remember that your doctor has prescribed this medication because he or she has judged that the benefit to you is greater than the risk of side effects. Many people using this medication do not have serious side effects. This medication may cause low potassium levels in the blood (hypokalemia). Tell your doctor immediately if any of these unlikely but serious side effects occur: muscle cramps, weakness, irregular heartbeat. People who have a rare blood disorder (polycythemia vera) may infrequently have symptoms related to this disorder while taking cyanocobalamin. Seek immediate medical attention if any of these rare but very serious symptoms occur: chest pain (especially with shortness of breath), weakness on one side of the body, sudden vision changes, slurred speech. A very serious allergic reaction to this drug is rare. However, seek immediate medical attention if you notice any symptoms of a serious allergic reaction, including: rash, itching/swelling (especially of the face/tongue/throat), severe dizziness, trouble breathing. This is not a complete list of possible side effects. If you notice other effects not listed above, contact your doctor or pharmacist. In the U.S. - Call your doctor for medical advice about side effects. You may report side effects to FDA at 1-800-FDA-1088. In Canada - Call your doctor for medical advice about side effects. You may report side effects to Health Canada at 1-866-234-2345. 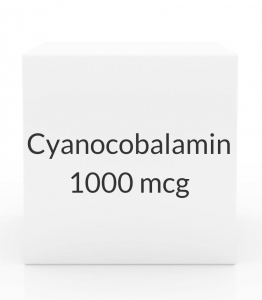 PRECAUTIONS: Before using cyanocobalamin, tell your doctor or pharmacist if you are allergic to it; or to cobalt; or if you have any other allergies. Your doctor may recommend that you receive a smaller test dose before starting your regular dose. This product may contain inactive ingredients, which can cause allergic reactions or other problems. Talk to your pharmacist for more details. Before using this medication, tell your doctor or pharmacist your medical history, especially of: low potassium blood levels (hypokalemia), gout, a certain blood disorder (polycythemia vera), a certain eye disease (Leber's disease), other vitamin/mineral deficiencies (especially folic acid and iron). This product may contain aluminum, which can infrequently build up to dangerous levels in the body. The risk may be increased if this product is used for an extended time, especially in newborns or in people with kidney disease. Tell your doctor immediately if you notice any symptoms of too much aluminum in the body such as muscle weakness, bone pain, or mental changes. During pregnancy, this medication should be used only when clearly needed. Discuss the risks and benefits with your doctor. Based on information from related drugs, this medication may pass into breast milk. Consult your doctor before breast-feeding. DRUG INTERACTIONS: Your doctor or pharmacist may already be aware of any possible drug interactions and may be monitoring you for them. Do not start, stop, or change the dosage of any medicine before checking with your doctor or pharmacist first. Before using this medication, tell your doctor or pharmacist of all prescription and nonprescription/herbal products you may use, especially of: drugs that may affect blood cell production (e.g., chloramphenicol, anti-cancer drugs, HIV drugs), other vitamins/nutritional supplements (especially folic acid). Certain other drugs may interfere with laboratory tests for vitamin B-12 levels, possibly causing false test results. Tell laboratory personnel and all your doctors if you take any of the following: anti-infective drugs (e.g., amoxicillin, erythromycin), methotrexate, pyrimethamine. This document does not contain all possible interactions. Therefore, before using this product, tell your doctor or pharmacist of all the products you use. Keep a list of all your medications with you, and share the list with your doctor and pharmacist. OVERDOSE: Overdose with this medication is very unlikely. However, if an overdose is suspected, contact your local poison control center or emergency room immediately. U.S. residents can call the U.S. National Poison Hotline at 1-800-222-1222. Canada residents can call a provincial poison control center. NOTES: Do not share this medication with others. Laboratory and/or medical tests (e.g., serum potassium levels, complete blood count, hematocrit, vitamin B-12 levels) should be performed to monitor your progress or check for side effects. Consult your doctor for more details. This product is not a substitute for a proper diet. Remember that it is best to get your vitamins from healthy foods. Vitamin B-12 is commonly found in many foods from animals, especially liver, kidney, fish and shellfish, meat, and dairy foods.